LD Chris Fernandez and 4Wall Light the 2018 Jackson National Sales Meeting | Press Center | 4Wall Entertainment, Inc.
Nashville, TN- Jackson National Life Insurance Company (Jackson), a leading provider of retirement products, held their national sales meeting this month at the Omni Nashville Hotel. The conference brings together all Jackson employees to talk about the company's future and main goals for the year and to celebrate the past year's accomplishments. 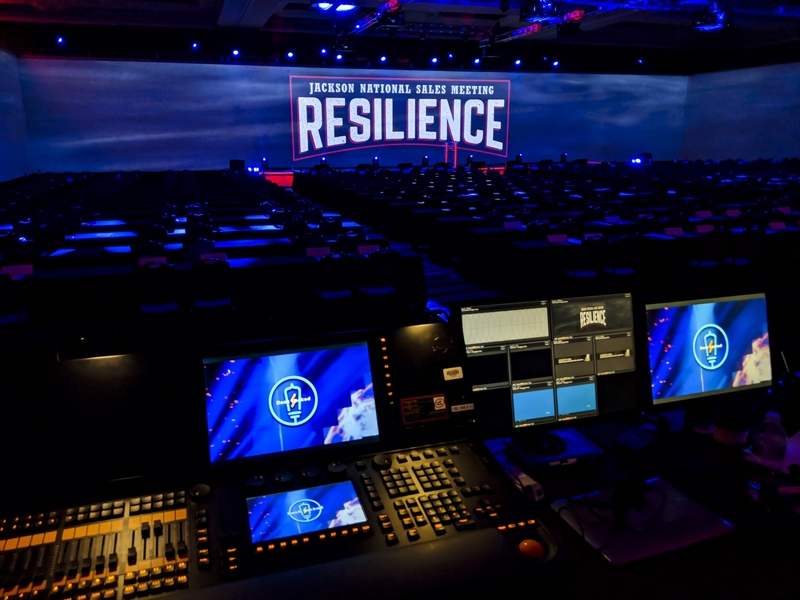 Lighting Designer Chris Fernandez utilized gear from 4Wall Entertainment to revamp an ordinary ballroom conference into a memorable and motivating experience. The conference was dubbed 'Resilience' and incorporated a boxing theme. Boxing legend and six-time world champion Sugar Ray Leonard was a special guest who gave a motivational speech and shared past experiences. "The goal of the lighting design was to create impactful, eye-catching looks with a simple design for the conference," said Fernandez. "We wanted to make an ordinary, boring ballroom become its own intriguing environment which was a challenging factor when drafting this design." 4Wall provided Robe Pointes which were used as the eye-candy for guest speaker introductions, presentations, and to generate energy within the ballroom. "The Robe Pointes provided a clean and powerful beam for the camera and are a very versatile hybrid fixture when creating unique looks," explained Fernandez. "We showed them off at the beginning of the conference during a light show to the 'Eye of the Tiger' song." Martin MAC Aura XB fixtures were also used for eye-candy as well as back lighting on the stage. "The Auras XBs are very powerful fixtures and have a really good zoom and very rich color output," said the LD. "These fixtures provided a very clean edged backlight for our guest speakers on stage for the conference." ETC Source Four LED Series 2 Lustrs lived above the stage and provided key lighting for the speakers. "These fixtures were important because we were broadcasting and recording the event," explained Fernandez. "We needed reliable lights that would look great on camera." Chroma-Q Color Force II LED battens lit the bottom of the stage behind frosted plexiglass to create a solid background and chase effects. Chauvet Professional Colorado 1 Solo pars were utilized as truss warmers. Fernandez spoke on the service 4Wall provided. "The service from 4Wall was astounding! They never cease to impress me with their gear and it's always on point and in good condition. Their team is also always there to aid us during last minute things." For more information on Chris Fernandez and his company Limitless Design Group Inc., check out their Facebook and Instagram.